What Brought You Here? 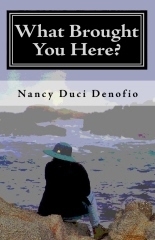 is the debut poetry collection from Nancy Duci Denofio of Saratoga Springs, NY. Her poetry is the product of a keen sense of observation and detail, providing a colorful canvas of time and place which she paints with words as her medium. As she writes: "As a poet my words fill my mind as paper fills the floor where I work. I find words unending - what we create comes from deep inside of us, and each artist shares through expression without hesitation." In this volume, she addresses universal themes of fundamental importance to us all - the bliss and wonder of love, the agony and pain of death and separation, and the simple joy of being alive - that are sure to strike a chord with readers everywhere.